The town of Brunswick, Md. (canal mile 55), is one of the largest along the 185-mile stretch from Washington to Cumberland. Brunswick is rich in river history and in the history of the Iron Horse. Both the B&O Railroad and the C&O Canal came to Brunswick in the 1830s. Canal Lock 30 is in Brunswick. A mill was built along the canal around 1845 and was operated by water power from the canal. 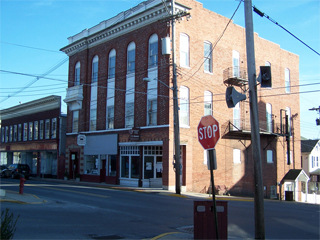 The town was established by a royal grant in 1753, and a ferry across the Potomac was set up in 1822. Later, a wooden bridge crossed the river. The wooden structure was burned by the Confederates in 1861, but replaced by a pontoon bridge built by Union soldiers. After the Battle of Antietam, a Federal army under General McClellan crossed here. Later, General Meade's army crossed after the Battle of Gettysburg.